As we head into the transition between spring and summer, the plethora of options at the local Farmers Market make for colorful, flavorful meals. This pairing was so much fun and oh so tasty. The lingering flavor of the fennel boosts the Chardonnay, bringing out beautiful notes of honey and yellow apple. 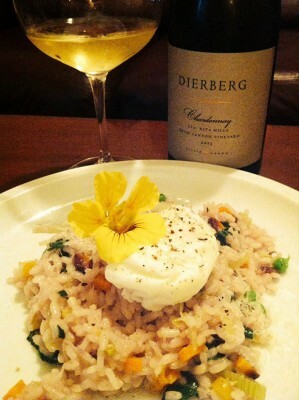 The luxurious texture of the egg saturating the rice brings no need for cream in this risotto. Smooth and seasonal, a dish for any occasion. Begin with at least 4 or 5 spring vegetables. I grabbed fresh spinach, peas, fennel bulb, leeks and a assortment of colorful carrots. Wash and chop veggies, set aside. Heat chicken stock in small pot and reserve on low heat. Heat a heavy bottomed pan to med-high heat. Add 1 tbsp butter and a drizzle of olive oil to pan. Once butter has melted add 1 1/2 c. dry arborio rice. Toss until rice is well coated and slightly toasted. Reduce heat to med. Add garlic and leeks. Sautée until fregrant, about 2 mins. Add 1/2 c wine and stir until absorbed. Add chicken stock 1 c at a time, waiting until liquid has been absorbed before adding the next, stirring intermittently. Meanwhile in a separate pot, prepare poaching liquid by adding 1 tbsp white vinegar to boiling water. Add carrot and fennel to risotto, sautee another 5 mins. Add remaining 1/2 c wine and stir until absorbed. Lastly, add shelled peas and torn spinach, toss and cover. Remove from heat. Stir boiling poaching liquid with a spoon to create a whirlpool before cracking your farm egg into pot. The vinegar and spiral motion of the water will help keep the shape of your poached egg. Let poach for 2 mins. Meanwhile uncover risotto and toss parmesan. Peas and spinach should be steamed but not overcooked. Spoon out a mound of risotto to plate and top with poached egg using a slotted spoon. Garnish with edible flowers, extra parmesan and salt and pepper to taste. Enjoy with a glass of 2013 Drum Canyon Chardonnay!